The Travis CI Blog: It’s Travis CI’s 5th Birthday, Let’s Celebrate With Numbers! Five years ago today, the wild adventure of Travis CI started out. A hosted continuous integration platform that’s been free for open source projects ever since grew out of some personal experiments of building a better alternative to current continuous integration systems. What better way to celebrate than looking at a few numbers of how Travis CI has been doing recently and compared to its early days? Okay, you should still get some cake. Cake is a must to celebrate birthdays! What started out as a hobby project run and built by a group of volunteers is now the home of open source testing, used by thousands of customers, and a company employing 25 people. We currently have team members distributed over seven different countries, a number which we’re looking to expand over the coming months. The largest time difference between any two of them is 23 hours (Hawaii and New Zealand). In early 2012, Travis CI ran on 11 physical servers and was able to run about 40-50 concurrent jobs. The daily total reached a couple of thousand builds per day. In early 2016, our server fleet consists of more than 500 servers during peak hours. Most of it is now fluctuating wildly throughout the day and based on demand. During peak hours, 2000 jobs are running concurrently in the same number of virtual machines, cloud servers, and Docker containers. On January 27th 2016, during our All Hands, I’d predicted that we’d cross the line of running 300,000 jobs per day in the first or second week of February. On that very same day (January 27th 2016) Travis CI processed a total of 131,406 builds that in turn created 305,057 jobs based their respective build matrices. What does this say about my ability to make predictions? Email me with some numbers to find out! For comparison, that same day in 2015, Travis CI processed 71,991 builds that created 163,319 jobs. 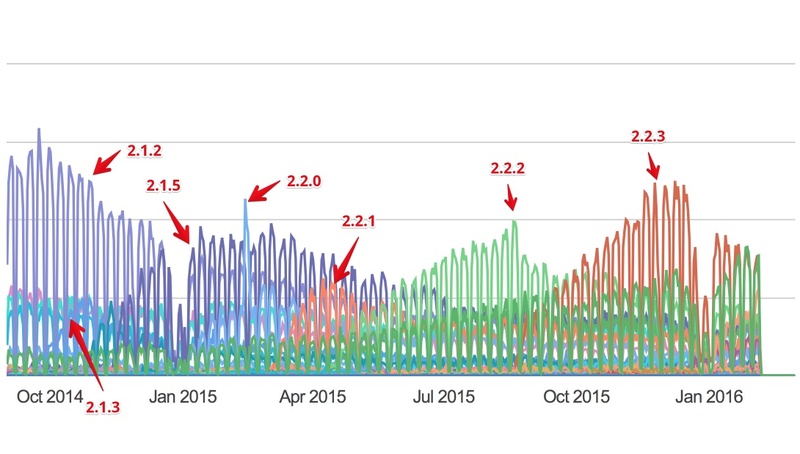 In total, Travis CI processed 24,417,316 builds in 2015 which in turn created 58,544,422 jobs. The infrastructure demands to support the numbers above have grown significantly over the past couple of years. In 2015 we spent a total of 1,367,974.40 € (roughly US$ 1,530,000) on build infrastructure alone, not including any other external services we’re using. For comparison, our early server bills that we started covering ourselves were less than 1,000 € per month. In 2015, a total of 306,799 projects were using Travis CI. Node.js is the fastest growing language platform on Travis CI. In January 2015, there were 6,604 active Node.js projects every day. Over the year that number has grown to 12,575 in January 2016. It’s fascinating how relatively quickly new versions are adopted and phased out again as soon as new versions come out. I tip my hat to our customers (these are data from private projects) for keeping their projects up to date! Everything that’s going on in the numbers above is mind-boggling to us. The scale at which Travis CI is now operating is far beyond anything we could have imagined when this started out. The last five years have been amazing, an incredible ride, and we’d like to thank our customers, our communities, the volunteers and our entire team for making all of this possible.